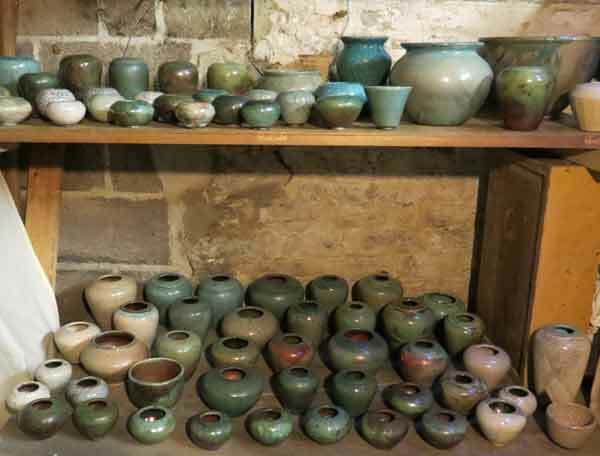 This page gives a view of some pottery at Bill Crumbleholme's Pottery Studio at his home. The images will form an archive of the studio's pottery, following a massive reorganisation that took place to enable the studio to open in September 2014 for the Artwey Art Trail, in Weymouth and Portland - Details of that whole event are at this link. The studio is usually only open by appointment, the Art Trail was the first time it was open to the public during an Open Studios event. 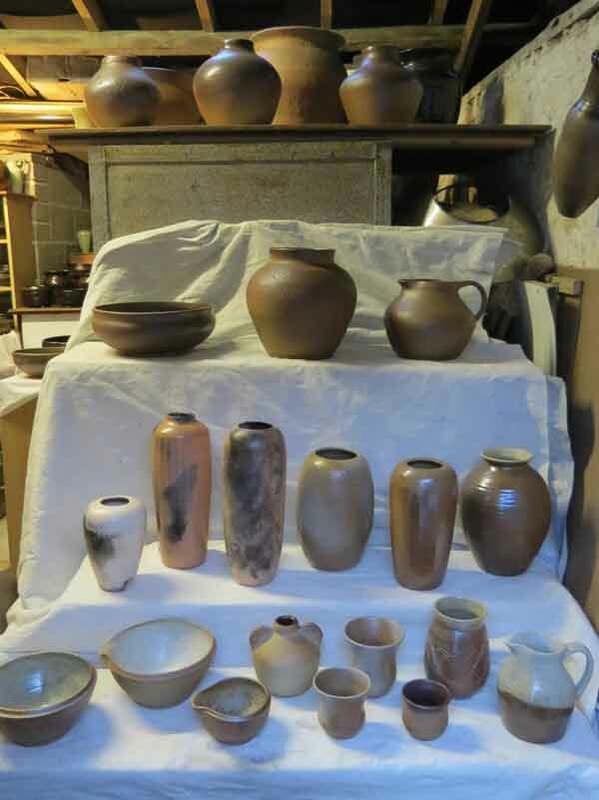 Bill normally uses the Upwey Old School Village Hall for his exhibitions, often with the Upwey Potters, he also teaches and runs workshops there, rather than at home. 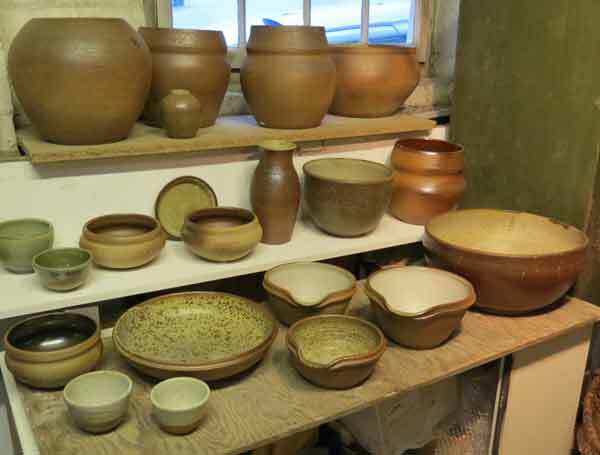 Display of pottery - foregound wood fired jugs and Mortaria type bowls, lefthand back racks Soda fired and wood fired vessels, righthand back Burnished and smoked wares. The studio was set up in the late 1970's when Bill moved to the village of Upwey, the buildings were previously used by the Lovering family Butchers, hence the name sometimes used for the pottery "The Old Slaughterhouse"! On arrival there were still chains hanging from old oak posts round the walls, where animals would have been tethered before meeting their end. 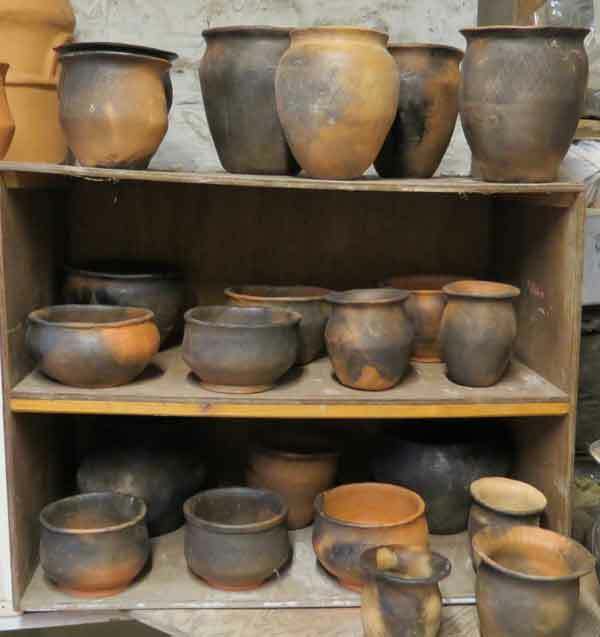 An Assortment of Pots, set out to greet visitors! Some work was done to improve the facilities, a new concrete floor was poured to raise the level above the road to avoid so much flooding, the rear wall and roof was rebuilt. Gradually over the decades, the studio filled up with an assortment of junk, bits of family stuff, windsurfers (when Bill was a young man addicted to that great new sport) and Guiding equipment (Diane, Bill's wife, was a Girl Guide leader) and of course Bill's stock of pottery. The studio is in 3 sections, acoss the road from Bill's house. 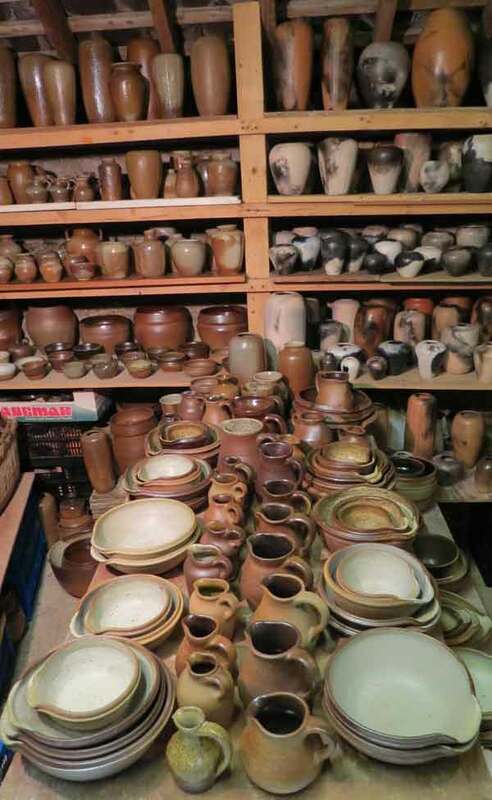 The store up the road is where finished stock is stored, the middle is where pottery is sometimes made on the wheel and the lower section is the kiln and glazing room. Bill's first work space was in his parent's garden summerhouse, which he quickly filled with pottery as he taught himself to throw on his sit down kick wheel, bought from Briar Wheels in Fordingbridge - one of their first customers! Then he moved into Weymouth town and lived above the office where he worked in the family building business. He set up a pottery in the yard with a new Kilns & Furnaces electric front loading kiln - which is still going strong 40 years later! 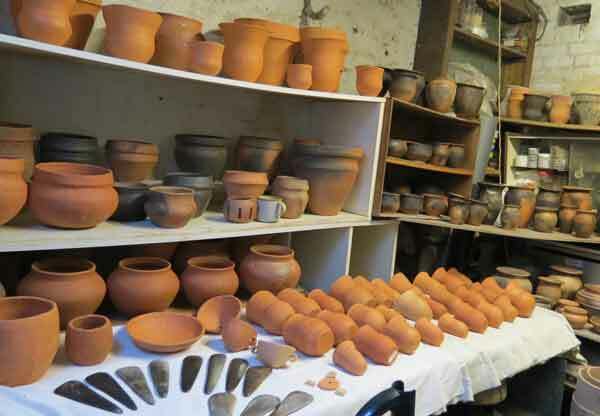 He produced masses more pottery and got a bit better at throwing. Then he got married and moved to Upwey.